BBC NEWS | UK | Magazine | How dangerous is drum making? 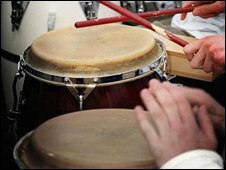 How dangerous is drum making? A second drum maker in two years has died after apparently inhaling anthrax spores from animal skins. What are the risks of this seemingly safe job? Fernando Gomez had been in intensive care for more than a week after handling animal skins at his drum-making workshop in London. But his condition deteriorated over the weekend and the 35-year-old died from inhalation anthrax on Sunday night. Two years earlier, Christopher Norris, a craftsman from Scotland, died after inhaling anthrax. But are these cases a coincidence or a cause for alarm? In the UK, the death of Mr Gomez is the second case in more than 30 years. Across the world, there are four other known cases since 1974 of drum makers dying from anthrax. It is difficult however to put these figures into context. There are no official statistics on the numbers of drum makers and handlers of skins for drum making in the UK come in many guises - the amateur attending drumming workshops, the professional who tends to work independently, members of African communities who carry out repairs and the drummer who replaces his skins himself. 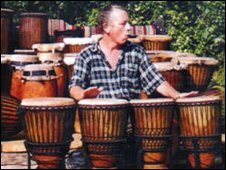 African drumming is growing in popularity in the UK, but any drumming community is informal and loosely-knit. Health experts do stress though that cases of death from anthrax are extremely rare among drum makers, and drum players are in no danger at all. Anthrax is a naturally occurring disease, which can sporadically affect cattle and goat herds, as well as more exotic animals such as llamas, yaks and bison, all around the world. The skins of cows and goats, in particular, are used to make traditional African drums. Outside of the African tradition, drum skins are usually more processed and come prepared without any hair. Most European drums are made from man-made fibres, except for some antique orchestral drums and the Irish Bodhran, made with goat or deer skin. Drum makers say hides produce a better sound and are gentler on the hands. Dr Phil Luton, of the Health Protection Agency, said the "vast majority" of skins imported for drum making would not be infected with anthrax. Anthrax can be contracted through cuts to the skin (cutaneous anthrax) or by inhaling the spores (inhalation anthrax), the latter being the harder to detect and to treat. Drum makers are at risk, however low, during the preparation of the skin, which involves stretching it over the frame and scraping hair from the hide to give it a smooth finish. The danger lies in inhaling agitated spores or an open wound becoming infected. The Health Protection Agency (HPA) says there are no other occupations known to be at risk, as jobs like rug making are more rigorously regulated. In the case of drum makers, the HPA advises carrying out work in a well-ventilated space and to avoid breathing in dust. It says it will be reviewing its advice once the findings of the investigation into Mr Gomez's death are available. Drum maker John Sullivan, also known as Bodhi, uses the common-sense approach, which has worked for him for the past 20 years. He makes djembes, a goblet-shaped West African hand drum, by carving a solid log from hardwood and covering it with goats' skin imported from Gambia and Senegal. He says he is careful not to cut himself when shaving bristly hair off with a double-edged razor blade and has considered wearing rubber gloves. When rubbing down a bristly skin, he goes outside and checks the wind direction to ensure any spores blow away from him. The 54-year-old, from the Suffolk coast, said the latest death had made him think twice about his own safety, but not enough to stop. "I have been doing it 20 years and I'm still here," he said.